New parents get so much happiness from their little bundles of joy - but infants who have colic can also make them very frustrated, with seemingly endless hours of crying and screaming by the new arrivals, for no apparent reason. Now, though, research may be pointing to a simple and safe way to reduce the excessive crying. A new study in the journal Pediatrics finds that a daily dose of a probiotic dietary supplement can help reduce all the fussing. The study, explains CBS News Medical Correspondent Dr. Jennifer Ashton, looked at about 50 colicky infants who were given either a probiotic or a placebo for three weeks. Each of the infants had been crying for more than three hours a day. The researchers found that the probiotic helped reduce their daily crying by a-third compared to the babies who didn't take it. They think the supplementation may improve digestion. 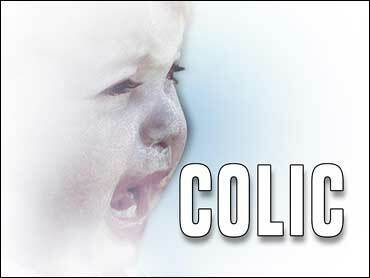 It appears to be a possible treatment for colic, for which there usually aren't many treatment options. Doctors use "the rule of threes" in deciding which babies are considered colicky: when a healthy bay cries for three or more hours per day, for three days or more a week for a minimum of three weeks. That puts a lot of stress on parents and caretakers. "It's not a disease, it's not the parents' fault. It's not a poor digestive tract. We tend to know what it isn't more than we know what it is," Ashton remarked to co-anchor Chris Wragge on "The Early Show." Colic affects up to 28 percent of all infants -- and is generally worst when babies are around 6- to 8-weeks of age. When they're crying, they may clench their fists and stiffen their stomach and legs. Some babies arch their back, while others pull up their legs to their stomach. Doctors aren't sure what causes colic -- that's why there are so few treatment options for it. They think it may be due to an immature nervous system or gas production. Probiotics, in foods such as yogurt, are gaining popularity for adults. They help promote the growth of "good bacteria" in the body. Most probiotics are bacteria similar to those found naturally in intestinal tracts, especially in those of breastfed infants (who have natural protection against many diseases). This study found that this particular type of probiotic, called Lactobacillus reuteri, was well-tolerated and safe. In the study, researchers found that this was safe in infants younger than 2-months, with no adverse events related to the supplement. Is it available in baby food? How can babies take this probiotic? It's a good idea to talk to your pediatrician about any dietary supplements you're considering for your child. This was a small study and more research needs to be done. You can find this type of probiotic in drops that can be added to their meals -- which was done in this study -- and there are some yogurt-based infant formulas out there, as well.